Use with non-cellular devices requires a WiFi connection. Mobile Web provides real-time location and next stop information as well as a small map for all active vehicles and routes. You can even access announcements that might impact your ride. Your operator's charges for using the Internet on your phone may apply depending on your data plan. How do you access the mobile site? Go to http://ccrta.transloc.com/m/ on your mobile device's browser. My phone doesn't include a data plan. Isn't checking the internet on my phone expensive? Actually, it's not. We designed the Mobile Web site so that it would be inexpensive to access, even if you don't have a data plan. The site relies mainly on text to display bus location and destination and doesn't have any complex graphics to load, meaning you won't use many kilobytes to access the real-time location of your bus. Check with your operator to determine the rates that apply to your phone and plan. Most mobile phones on the market now have internet-capability even if you don't have a smartphone. You can check for the internet on your phone by looking for a web browser with one of the following labels (depending on your phone and carrier): net, web, browser, Opera, Safari, Internet Explorer, MediaNET (on AT&T Wireless), Power Vision (on Sprint), or Get It Now > News & Info (on Verizon Wireless). Message and data rates may apply. To Opt-out text STOP to 41411. For more information text HELP to 41411. Users without a text messaging plan may consider using the Mobile Web site as a more cost effective option on many carriers. How do you find your stop code? 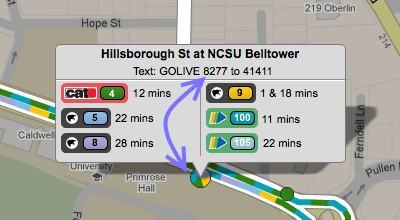 To find your stop's code, go to the main map and click on your desired stop. Below the stop's name you will see the "stop code" listed. The stop code can also be found when looking at individual routes. The SMS system supports powerful search capabilities to allow you to narrow down your results. You can also mark stops as favorites.